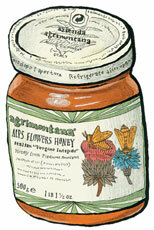 High Mountain Honey for sale. Buy online at Zingerman's Mail Order. Gourmet Gifts. Food Gifts. Thousand flower honey from the Italian Alps. This miele di alta montagna (high mountain honey) is gathered high in the Italian Alps each spring, when the bees are feeding on flowers 4,000 feet above sea level. Almost solid in texture—but still spreadable—it has a phenomenally complex flavor that hints of mountain herbs and wild flowers. For some reason, marketers insist that Americans won't buy crystalline honeys like this, so I have to believe that they've never tasted this one. To me, it's the essence of mountain pastures distilled down to a honey that is perfection. Dig down into the jar and scoop out a spoonful. Be careful to catch the amazing aroma that wafts from within. Then slide your tongue slowly across the spoon, feeling the crunchy honey crystals, each releasing its tiny burst of the flavor of mountain flowers. Let it melt softly, slowly on your tongue.